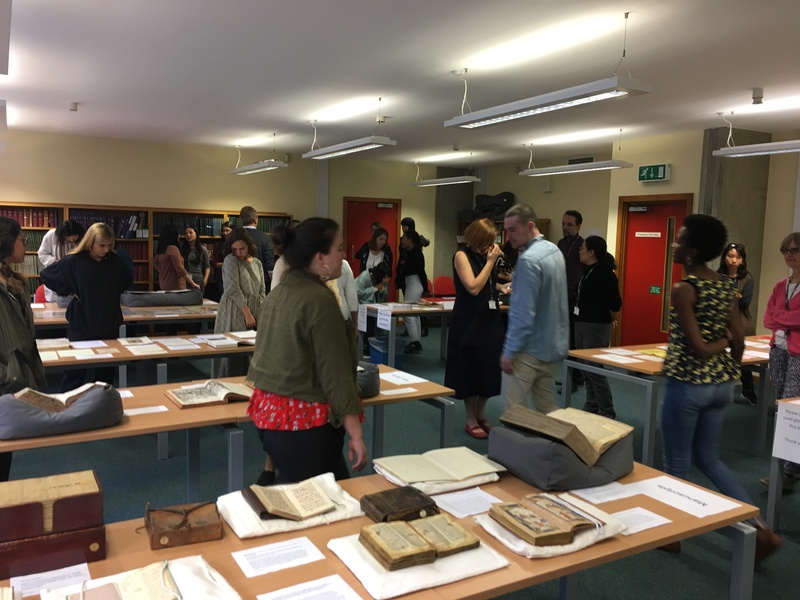 We’ve had quite a busy time of it lately here at SOAS Archives, introducing new students to our search room and some of the treasures of our collections. 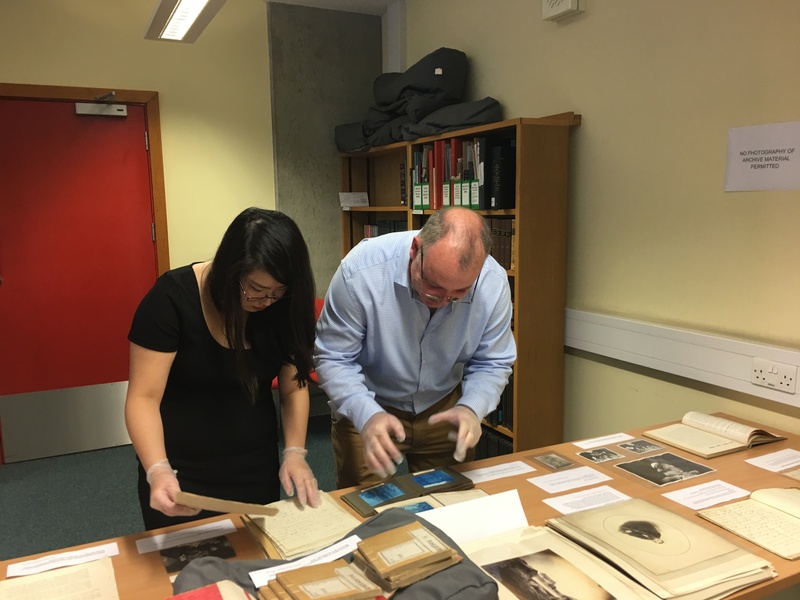 Our annual Open Day proved a huge success attracting over 100 members of staff and students to come and look at a large display of material and take part in behind the scenes tours of the archive stores. The Archives and Special Collections at SOAS broadly reflect the experience of British businesses, organisations and individuals who were living and working overseas over the last 250 years or so, from colonial times to the more globalised present and comprise many different types of material including letters, diaries, financial records, film, photographic and audio material as well as rare books and manuscripts and some special formats such as woodblock prints, maps and posters. When choosing material for our display we always try to showcase as wide a range of material from our collections as possible in order to give a taste of the different types of documents we hold and the geographical regions we cover. Among the biggest collections here at SOAS are the missionary collections. The earliest, and largest of these, the Council for World Mission (deposited in 1973) comprises around 3000 boxes and includes correspondence, diaries, annual reports and candidate papers for missionaries working in Africa, Caribbean, East Asia, Europe, Pacific and South Asia. Alongside material from the CWM we also displayed some items from the Methodist Missionary Society, the second largest of our collections deposited in 1978 and containing around 1500 boxes covering the work of missionaries in Africa, Middle East, Pacific, South Asia and the West Indies. A rich source for students of mission history, these collections, along with the other missionary collections held at SOAS, are an invaluable resource for research into family history, history of place or region, study of the development of education or medicine in a particular part of the world, gender, sociology, ethnography, linguistics, translation, the early documentation of indigenous languages, the development of printing, geography, natural history…I could go on, but you get the idea! On another table we focused on presenting some of the material from on our NGO and campaign collections including examples from War on Want, the Movement for Colonial Freedom, the Western Sahara Campaign and Christian Aid. These types of organisations and charities largely took on some of the activities traditionally undertaken by the Missionary Societies such as emergency relief work in cases of flood and famine; political lobbying; medical, educational and vocational training overseas. 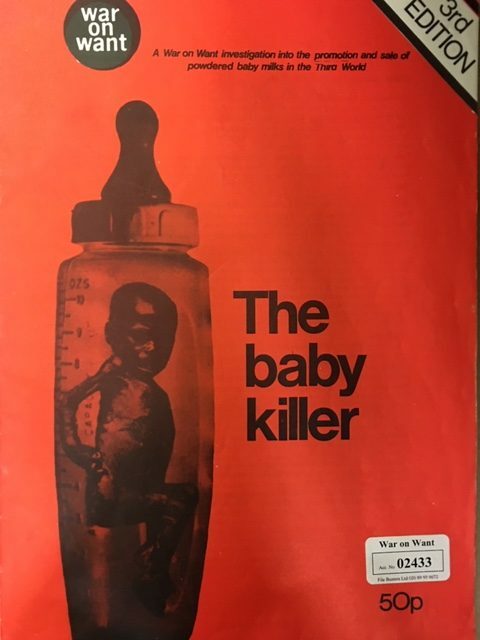 Some of the most striking material from these collections includes the ‘Baby Killer’ campaign report commissioned by War on Want to expose how leading multinational food companies, such as the Swiss food giant Nestlé, were involved in marketing powdered milk for new-born children as a healthier option than breast milk to mothers in communities without safe drinking water and sterilisation facilities. A well-known example of the work of Christian Aid was the Live Aid / Band Aid campaign. Founded in 1984 by Bob Geldof and Midge Ure to raise money for disaster relief efforts in Ethiopia, Band Aid was a charity supergroup that released the song ‘Do they Know it’s Christmas’ for the Christmas market that year. The LiveAid concert held in 1985 was watched by an estimated global audience of 1.9 billion, across 150 nations. The papers at SOAS include correspondence minutes and reports documenting the involvement of Christian Aid. Business archives may not immediately sound like the most exciting treasure in a repository but, as well as the expected financial ledgers and accounts, they can hold a wealth of documents, including correspondence, staff files, minutes, and photographic material. The papers of John Swire & Sons, for example, give a frank and honest view of the challenges faced by a British business operating in China and the East over the last 200 years, documenting not only the direction and growth of the business, but also the political and social changes in the countries in which they were operating. Other material we selected for display gave a flavour of other business bodies like the Chinese Maritime Customs, and the Chinese Government Purchasing Commission and the papers of prominent individuals associated with these organisations such as Frederick Maze, Robert Hart and Reginald Follett Codrington Hedgeland. 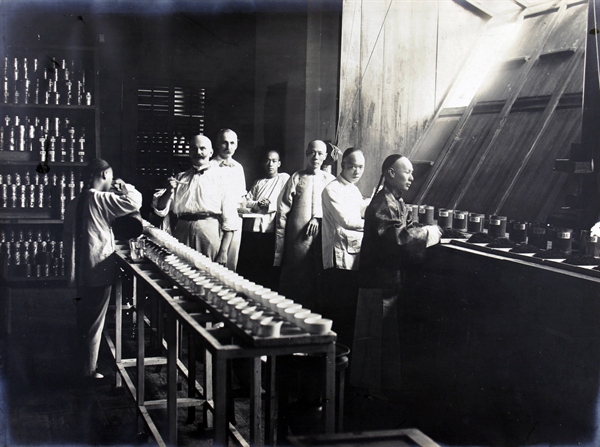 As well as the papers of large organisations such as these, SOAS also holds the papers of small independent business men and women such as Oswald and Dow, tea traders in China, Page, a trader in Africa, Boode, an antiques dealer in China, collections that are rich in photographic material and personal accounts of their time living and working abroad. We are also very proud of our rare books and manuscript collections. We hold over 2500 manuscripts here at SOAS, and these cover over 150 languages with significant holdings in Arabic, Persian, Swahili, South East Asian Languages, Chinese, Japanese and English with the earliest dating from the eleventh century. 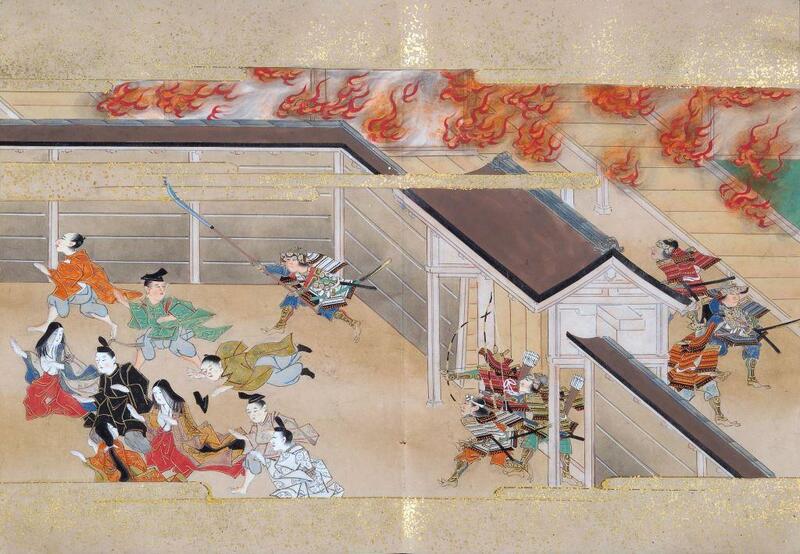 It is never easy choosing which of these to display but among those we selected were some palm-leaf manuscripts as well as the Heiji Monogatari and Hogen Monogotari (Tale of the Heiji Insurrection; Tale of the Hogen Insurrection) which are quite rare illustrated books of the early seventeenth century constituting the first historical war novel ever published in Japan. No display of material would be complete, of course, without including some papers of the School’s own Archive! The project to establish a School Archive began officially in July 2012 with the appointment of a Centenary Archivist on a one year post. Prior to this, only small parts of the collection such as the SOAS Picture Archive had been catalogued. Now the collection comprises reports, minutes, correspondence, handbooks and photographic material and is a rich resource containing the historical administrative records of the School. 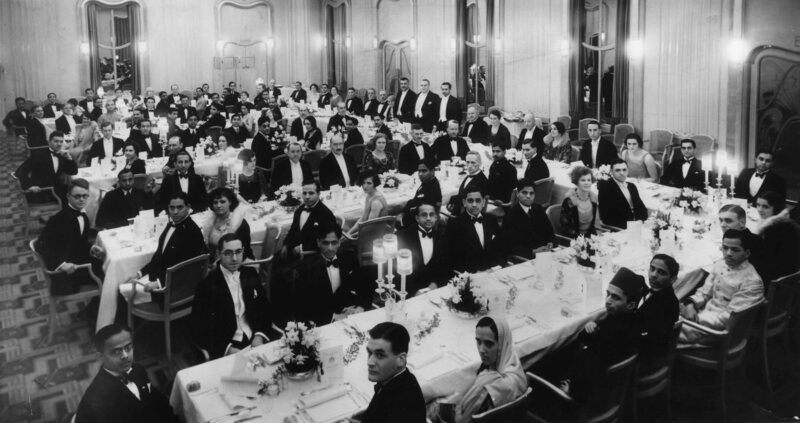 Some of the papers that we displayed this year included the original admission form of Paul Robeson to study Swahili and Phonetics at SOAS in 1934 as well as some great pictures of formal student union dinners from the 1930s. Safe to say that student nights out have changed quite a bit since then! If you are feeling inspired by what you have seen and would like to learn more, or perhaps have some questions of your own then please get in touch – we’d love to hear from you. You can email us at: docenquiry@soas.ac.uk, or give us a ring on: 020 7898 4180. Or you are welcome to come and see us – details on how to visit are on our webpage.